And no one puts new wine into old wineskins; otherwise the new wine will burst the skins, and it will be spilled out and the skins will be ruined. But new wine must be put into fresh wineskins. Why is resurrection life seldom found in the Church? In this Laodicean age of self-sufficiency, there is no need to be new. We are rich and increased of goods and have need of nothing (Rev. 3:17). Laodicea was a New Testament church. A church! The disciples had abandoned Jesus; Peter had denied him. They didn’t believe that He had been resurrected. They were men who discovered they could not follow Jesus faithfully. We have to desperately need to become new in every way. Humanly, we want new experiences and new revelation, but seldom do we understand our need to be entirely different beings, altogether changed. 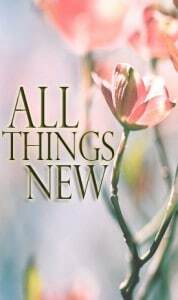 The NEED to BE NEW will open our eyes to the NEW that God has completely provided and lavishly given.